Next up is Marisa Egerstrom, leading her workshop Doing Jesus Stuff in Public (And Getting Away With It): Social Media Tools for Organizing. I first met Marisa in August of last year at an orientation for the individuals and institutions supporting the Episcopal Diocese of Massachusetts’ Life Together program. The Massachusetts Council of Churches is an internship site for Life Together and Marisa serves as one of the mentors to the young adult interns. I held onto Marisa’s card and thought “I should follow up with her.” Both of our lives took wild turns before we would meet in person again. Social media was one of the ways to stay connected in between meeting in person. I was going through the MCC’s search process for a new executive director and our transition to new leadership. On top of her doctoral program, Marisa became deeply involved with the Occupy movement. Soon, I was reading about Marisa and Protest Chaplain ministry on CNN’s Religion Blog. The Protest Chaplains are a fascinating story of (mostly) young, (mostly) lay leaders stepping out in faith to bring the Church’s concern for economic justice to the streets. Perhaps even more importantly than what they said was that the Protest Chaplains listened. Marisa and her colleagues took the time to be with the people in the Occupy encampments and listen to their struggles. They offered pastoral care.They have learned a lot about how the Church is perceived by those who struggle for justice but don’t identity with the Church. I had a great opportunity to sit down again with Marisa when the New England Chapter of Methodists for Social Action asked me to speak about “What the Church Can Learn from Occupy.” I am grateful to have Marisa as a dialogue partner. Her thinking is sharp. She cares about the Church as an institution but lovingly pushes it to new ways of witnessing. I have no doubt that Marisa’s workshop will help all of us think more theologically about how Christians faithfully participate in social media for social change. 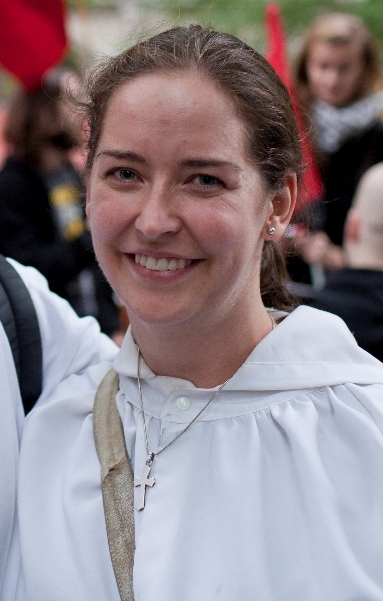 Having been trained in spiritual activism through a campaign with the Episcopal Diocese of Massachusetts’ Life Together program, Marisa Egerstrom initiated the Protest Chaplains, the only identifiable religious group present in the first weeks of Occupy Wall Street. Her piece written for CNN’s religion blog sparked the spread of the Protest Chaplains idea to cities across the U.S. and Canada as their Occupy encampments began. The Protest Chaplains have been featured in Occupy news in the UK Guardian, New York Times, and Washington Post, among other news outlets. Marisa is now working with Episcopalians for Global Reconciliation to launch a grassroots campaign to organize churches around the economic inequality issues raised by Occupy. Marisa is a PhD candidate in American Civilization at Harvard, where she is beginning her dissertation on the American military’s use of religion in Guantanamo Bay, and she is an active member of her Episcopal parish in Boston. The hype about social media has made it all but impossible to know what value online networking tools might have, especially for those of us who still believe that showing up to church – in person – matters. The Occupy movement presents a fascinating parallel to the churchy dilemma: although Occupy is widely understood to have relied heavily on social media to organize, the movement itself also understands there is no substitute for the gathering of actual bodies in a physical space and the face-to-face relationships formed there. This workshop will examine the Protest Chaplains as a case study in how one group used social media to provide ministry in several ways. In addition to practical tips, this workshop will propose solidarity as an Incarnation-driven model for developing media strategies in your own justice work and ministry.